Future British and Irish Lions tours must be reduced to eight matches to help with preparation, says the head of English rugby Ian Ritchie. The Lions will play 10 games this summer, with the opening fixture taking place just days after the squad arrives in New Zealand. 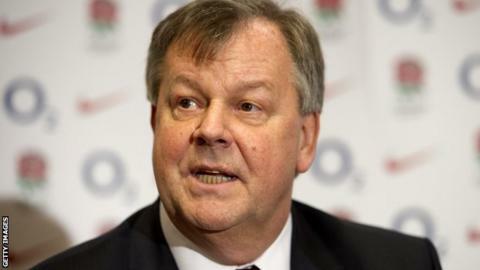 "I think it should be shortened from 10 games to eight," RFU chief executive Ritchie told BBC Radio 5 live. "It would have a helpful impact on preparation time, not a hindrance." The 10-match schedule has been described as "ludicrous" by leading figures in the English game. However, as recently as September the boss of the Lions, John Feehan, said tours must stay at their current length in 2021 and beyond. But following the shaping of the global calendar post-2019, it is understood the Lions accept shortening tours is now an inevitability. "On the current schedule for example, we are arriving [in New Zealand] and playing a game within three or four days," Ritchie added. "So if you could say we don't need to have that fixture anymore, it would give extra preparation time in the country, and that is a positive. "There is also a game that historically has been played in between the Test matches, which also causes certain problems, so I think reducing to eight is a sensible situation." High-profile players such as Jamie Roberts - a Lion in 2009 and 2013 - believe a 10-game schedule is necessary to protect the aura of the tours, but Ritchie feels a reduction would still retain the Lions lustre. "I think you have to make sure you are still competitive, and that is undoubtedly the balance if you reduce it too much," Ritchie added. "What the 10 to eight reduction does provide is an ability for greater preparation and greater rest. "If you get an extra week's worth of preparation, plus a bit of time off in between [the Tests], those are factors that need to be considered as positives in the schedule, as well as keeping it competitive which is what we want to do." Meanwhile, Ritchie says the RFU aren't guilty of double-standards by selecting Sale wing Denny Solomona for the tour of Argentina. Cross-code convert Solomona - a former Samoa rugby league international - has been picked after recently qualifying under the current three-year residency period, even though the RFU say they want to extend the waiting time to five years. The extension is expected to be ratified at a World Rugby council meeting next month. "The current qualification is three years, and therefore within the rules Denny is perfectly eligible, so why would we deny [head coach] Eddie [Jones] the chance to pick him?" Richie said. "Yes we believe the rules should be extended, and it should be five years - and we have agitated for that - [but] stick by the rules, and that is what we will do." Ritchie says the RFU didn't need to take a stand when it came to picking Solomona, in the way the French Federation has done by announcing only those with French passports are eligible for the national side. "That's up to everyone else to make their statements," Ritchie said. "[But] Eddie wanted to pick him, and he is obviously clear Denny is committed and wants to play rugby union for England, and therefore I think that is the right conclusion." Ritchie also said nothing has yet been confirmed when it comes to the length of the Six Nations post-2019, or the duration of the English domestic season. Players have voiced their concerns about proposals to both condense the Six Nations by a week and extend the Premiership campaign by a month. "I understand that, and listen to that," Ritchie added. "We need to go back and discuss further what the total picture looks like. It's not yet finalised."